This past weekend saw a proliferation of Christmas decorations in the town where we live in the Hudson River Valley. By Saturday evening almost every house in the village had put up Christmas lights, and garlands, and wreaths. Except ours, that is. We've been rather preoccupied with other things this season at Darlington House. Unlike our neighbors, we haven't (yet) put up lights outside or raised (yet alone even cut and bought) a Christmas tree. We have put out a footed bowl of vintage ornaments, but so far that's it. On Sunday, Boy decided that something must be done, and took matters into his own hands to raise the Christmas Spirit at our house. Just as he did so two years ago, Boy decided to make a wreath from the evergreens on our property for our front door. He cut sprigs of boxwood from one of the hedges, bound them in little bundles with floral wire, and fastened them to a wreath form that was left over from a previous Christmas. That little bulldog head you see on the wall above the completed wreath? That's a cast-iron bottle opener in the form of a bulldog's face, puchased in honor of my alma mater, Yale. Boola-boola! What a pretty wreath Boy has made for our front door at Darlington House this year! We're going to leave it just as it is, with narry a ribbon or ornament upon it. We like its unadorned simplicity, naturalness, and purity. We were at Yale a year ago for the graduation of my nephew, who mastered in architecture. It was a most memorable weekend. I have since commented that I was shown such beautiful examples of manners, people held doors for me, students stepped off the sidewalk to allow me to pass. Good manners still prevails at Yale campus. The wreath is wonderful. Simple, elegant and, at least in our eyes, a perfect choice for gracing the door at Darlington House. The smell of Box always reminds us of England. Your post has, therefore, made us wistful of the yards of clipped box hedges that are for us so quintessentially English. I, too, love the classic look. (Coco Chanel's "less is more" is one of my favorite quotes!) 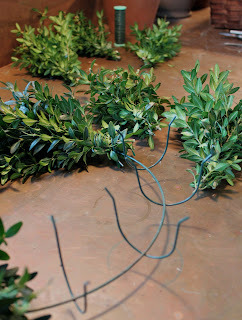 The wreath that adorns your door brings back childhood memories of my mother cutting boxwood clippings from the shrubs in our yard, followed by an afternoon of wiring all those sprigs into small bundles that we secured with floral picks. Once that task was completed, my grandmother would arrange them in a straw wreath that she had wrapped with stained muslin. The only embellishment was a simple, red bow made from one of the beautiful ribbons that Granny collected. Voila! The wreath was ready to hang on the front door. It was a masterpiece, or so I thought, each and every year. Thank you for bringing back such fond memories; I hope you and yours have a lovely holiday season. That's kind of a scary-looking bulldog. I bet it could beat Harvard all by itself. I always enjoy the smell of evergreens, but especially this time of year. 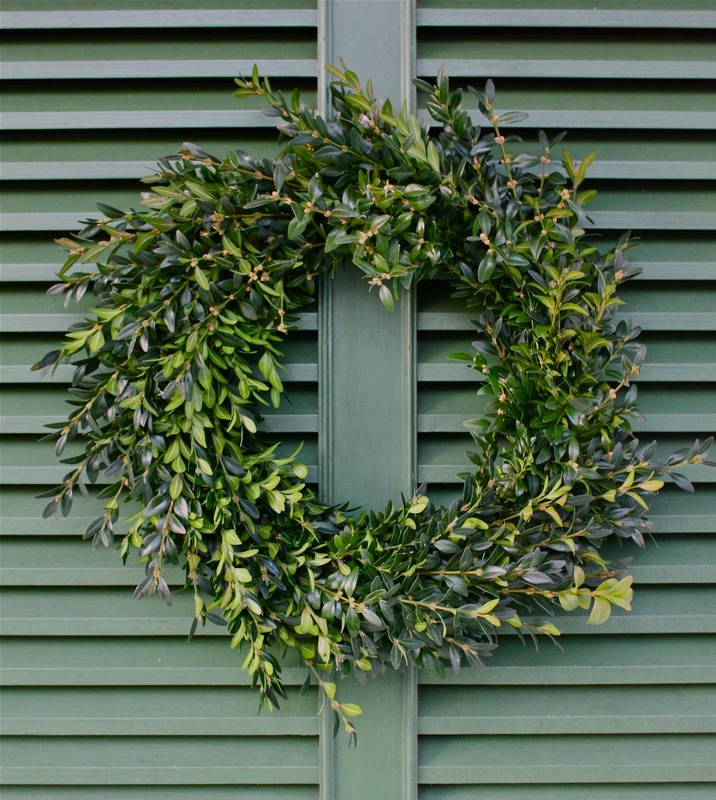 A natural wreath at the front and service doors guarantees a steady whiff. As cedar is (overly) plentiful here, it is often used despite that many prefer something more special. Boxwoods are also plentiful and visually admired, but I am constantly surprised by the remarks of those who object to the smell. I am reminded of a happy childhood associated with enormous green clouds of box, so there would never be a complaint from me, however. Maybe I am getting to be an old fogey already, but hurray for disabling the mobile mode! 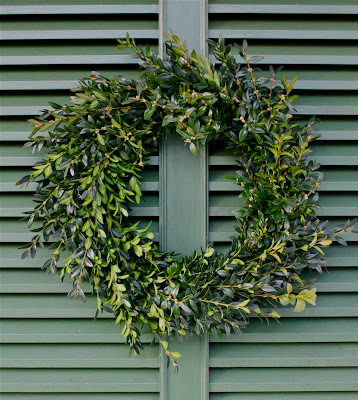 I do adore the classic freshness of a boxwood wreath! It truly is simply beautiful!!! All my boxwoods are either too small or topiaries, I need a big one so I can do this one day! Found your blog a few weeks ago, quickly becoming a favorite. Though it is hard for me to complain about the weather in South Florida this time of the year, I do miss the NE from September through Christmas. After which, I have no need to think or miss the NE as I sip G&T's in Palm Beach. I was rather hoping to drive by and see that you had put up one of those garish displays of inflatable "seasonal figures" on your lawn which, when you shut off the fans to inflate them, look like so much debris tossed from passing cars. But I guess you're just not in the holiday spirit! HT: I am most pleased that the students at Yale were courteous to you during your visit. How nice! 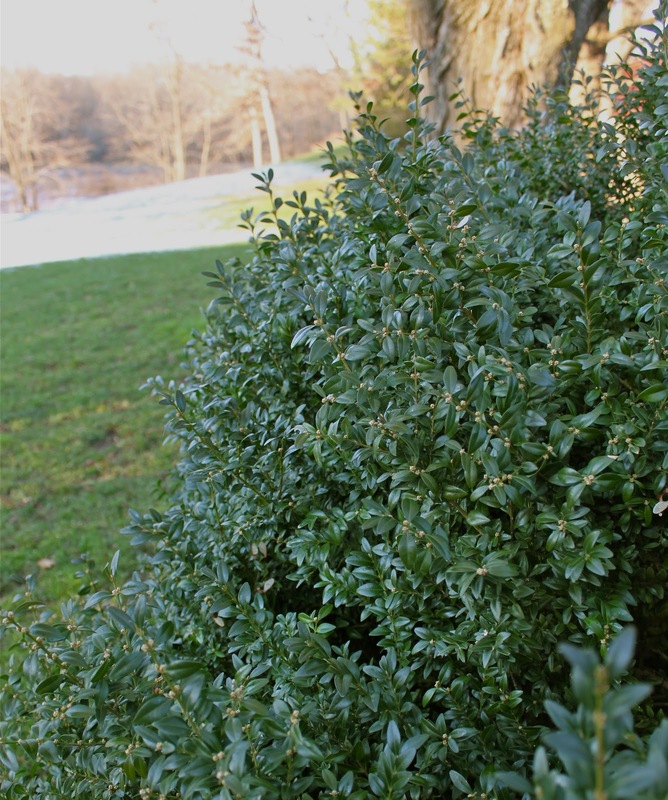 J&LH: Is there no boxwood in Hungary? I am surprised, I would have thought it would thrive there, too. Anon 10:56: What a delightful reminiscence of your darling Granny. Thank you for sharing it! MLS: The wreath frame was bought at a nearby garden center, underneath a completed wreath, filled with greens. We kept it/recycled it after removing the greens, and have used it several times since to make our own wreaths from evergreens on our property. Easy-peasy, as they say. Parnassas: And you should see that bulldog bite a cap off of a bottle of beer on a hot summer's afternoon! 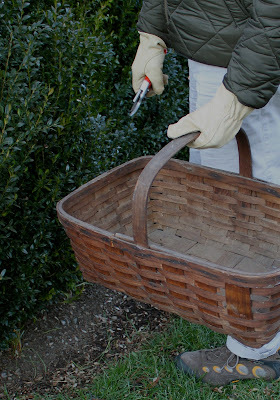 JJT: Interesting that people find the scent of boxwood off-putting. I adore it, although I understand why some people mightn't. Thank you. 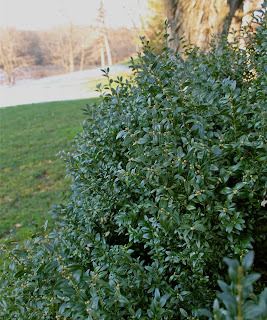 A&A: We are fortunate to have a large drift of mature boxwood at Darlington planted by previous owners. It is a happy hunting ground for making wreaths and such. We also planted a hedge of box shortly after we bought Darlington, however, it is years away from producing enough to cut. EMJ: Thank you for your comment, and welcome. Enjoy the G&Ts! Anon 11:06: Those deflated inflatables are a particular pet-peeve of mine. Most amusing! Simplicity is always so chic dahhling! My husband and I were lucky enough to live in a Colonial Williamsburg "kitchen" for several years and love the relative simplicity of things like boxwood wreaths. The smell seemed to permeate everything there yet I've noticed that doesn't seem to be the case anymore. And if I could get away with it, I'd drive through neighborhoods with a bb gun and shoot those inflatable horrors. If I ever develop some life threatening disease, I'm going to do it and blame my actions on my medication. Have a lovely, quiet, peaceful Christmas. This is the perfect example of it! Simple isn't easy......but it sure is PERECT! Please tell Anonymoius 4:40 pm.......I will fly to wherever he is and join him! (I have only a bee bee gun......he will have to supply the firearms!) I am so there! We have to do something!! What an absolutely endearing wreath. I recently read about a wreath made of prickly holly that was apparently hung to keep the affairs of one's heart faithful. It was actually rather charming to know that it was to ward off any sort of trouble at one's door. This year my son selected a frasier fir tree and the needles seem so tight and compact. There is barely a scent which I miss. However, I do not miss falling needles. I wonder if there is some sort of legend about that. Reggie, I thought of you today. 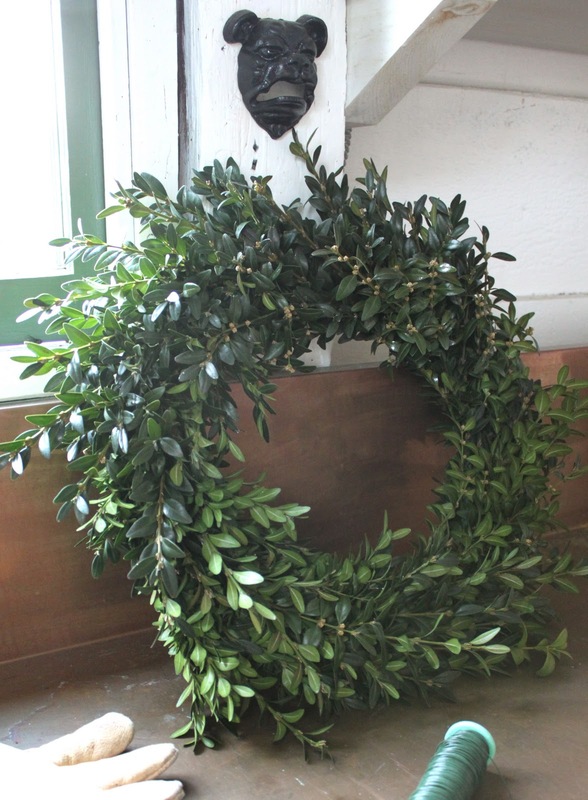 I went to the most glorious design shop, and they had a live boxwood wreath like the one Boy made. I had to smile. So lovely. Merry Christmas and kisses to Pompey! Such a chic wreath!! Looks like something straight from 28th street. Hope you, Boy Fenwick, and Pompey are enjoying every bit of the season. Beautiful wreath. So fresh and lovely. Here's to Next Year . . .
What We Didn't Do Last Night . . .